What if you could have a landscape filled with beautiful, flowering plants that needed pruning only once a year? Better yet, what if these beautiful plants needed little to no fertilizer and thrived in our desert climate? Would you want to include some of these plants in your garden? A couple of weeks ago, I was asked by the producers of Sonoran Living, a locally produced lifestyle show, to show some ‘fuss free’ plants suitable for fall planting. I shared a few of my favorites in my previous post, “Fuss Free Plants for Fall Planting”. Coral Fountain (Russelia equisetiformis) has a lovely cascading form and produces vibrant red flowers spring through fall. Maintenance: Prune back in March, removing frost-damaged growth. Plant in full sun or in light shade. 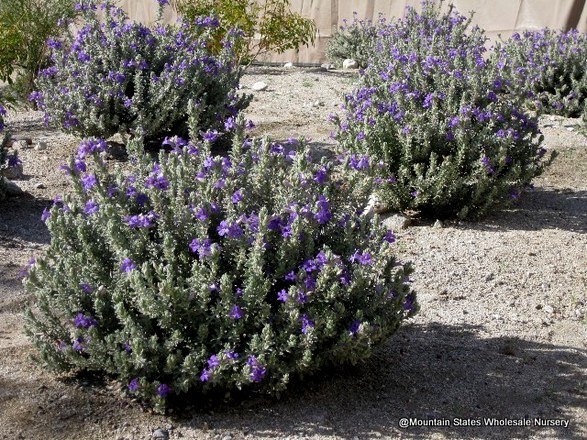 Desert Ruellia (Ruellia peninsularis) is a medium-sized shrub with light green foliage and purple flowers that appear spring through fall. This shrub is a great alternative for Texas Sage because it does not grow as large. Maintenance: Prune back to 1 1/2 ft. in early March. Avoid repeated pruning during the year. Allow it to grow into its natural shape. Plant in full sun and allow room for it to grow to its mature size of 4 feet wide. Phoenix Bird-of-Paradise (Caesalpinia pulcherrima ‘Phoenix Bird’) is the yellow form of Red or Mexican Bird-of-Paradise (Caesalpinia pulcherrima). Gorgeous yellow flowers appear all summer long on these tropical shrubs. Maintenance: Prune back to 1 ft. in winter. Plant in full sun, along a bare wall. Blue Bells (Eremophila hygrophana ‘Blue Bells’) is a relatively new plant introduction. Gray foliage is covered with blue/purple flowers off and on throughout the year. Maintenance: Little to no pruning required. Plant in full sun and pair with shrubs with dark green foliage such as Valentine (shown below). Valentine (Eremophila maculata ‘Valentine’) is a superstar in the landscape. The reason for this is its red flowers that appear all winter long and into spring. Better yet, the foliage is evergreen. Maintenance: Prune back to 1 1/2 ft. high and wide in late spring, after flowering finishes. Don’t prune more then this or flowering will be reduced later in the year. Plant in full sun in groups of 3 to 5 for best effect. Pair with yellow flowering plants such as Angelita Daisy or Brittlebush. Gopher Plant (Euphorbia rigid) is a uniquely shaped succulent that produces chartreuse flowers in spring. Maintenance: Prune back flowers after they dry in late spring. Plant in groups of 3 around boulders. I hope you enjoyed seeing some of my favorite ‘fuss free’ plants. What are some of your favorite low-maintenance plants? Hi Noelle, I just saw your no fuss plants on sonoran living and found my way to this post. I love the blue bells you mention. Is that one easy to find around the valley since it is fairly new? I don't see it in the handy dandy Landscape Plants for AZ Desert handbook. Do you know if it's slow, moderate, or fast growing? Also, I had a question about the valentines. I had 3, and over the course of 5 years, they have all seemed to die on me. They were all about 3-4' x 3-4' shrub size. One under an oleander tree. (That one died last.) What seemed to have happened is after it flowered, a few months after, it just looked like it would slowly dry up and eventually die. Maybe I didn't water it enough? I guess I ask because I want to replant them, but don't really want them to die on me again. They didn't seem super hardy to me, but you are the expert, so I though I would ask. It sounds like you're pretty busy, so if you ever get a chance to respond, I'd greatly appreciate it. Thanks for all your tips and stories! 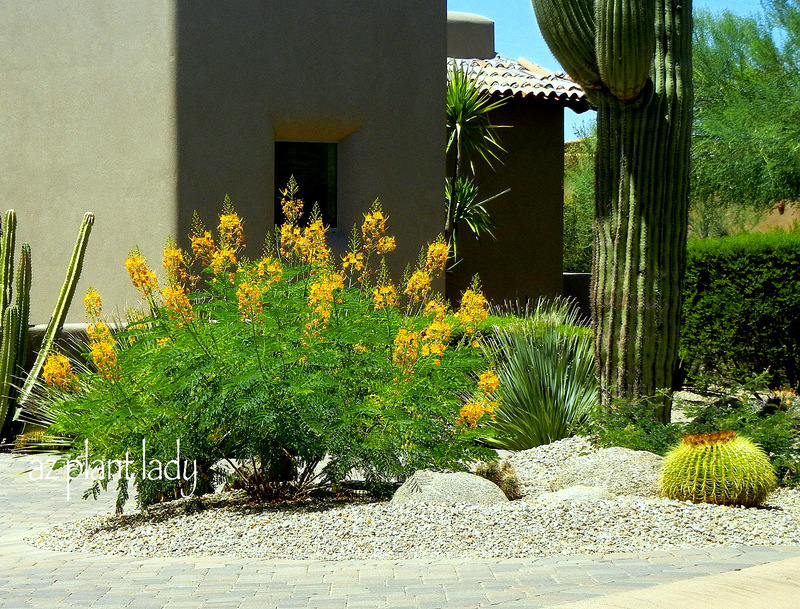 Fuss-Free Plants for Fall Planting AZ Plant Lady Drive By: What Is Wrong With This Landscape?